What are all the numbers at the top of my deluxe report? Can I get them decoded? This is known as the Vehicle Order Image. When an order was placed for a vehicle, a computer card, known as an Order Card, was created. This was based on what many people back then referred to as IBM punch cards. The series of punches below correspond to numbers or letters (incidentally, a punched out piece is called a chad). There were 80 columns on an Order Card. The first 11 digits (up through 1980) corresponded to the serial number of the vehicle. Other spaces provided information such as, in this example, the paint code "S" in column 15, which corresponds to Medium Gold Metallic paint.. 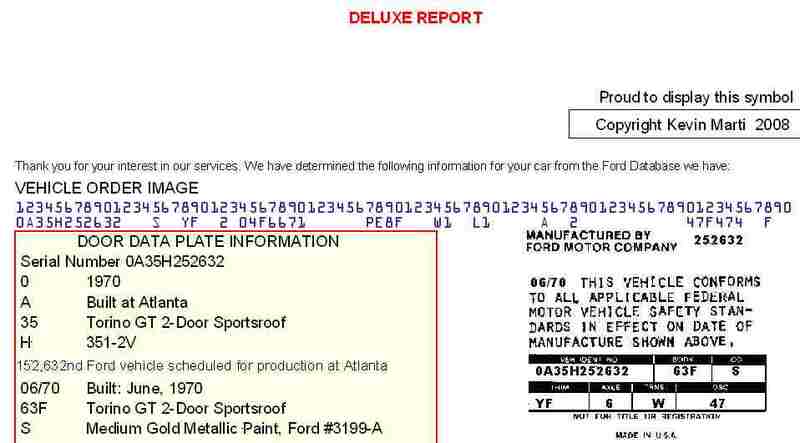 This Order Card data formed the basis for producing your vehicle. All the options, as well as the Ordering Dealer and the DSO Item Number were contained on this card. Our report reproduces this image data, as seen below. We do not offer a decoding of the individual lines, but the Deluxe and Elite Reports have all the data decoded into usable information. In time, we will offer reproductions of the Vehicle Order Card. If you are interested in having this item available, contact us to let us know at sales@martiauto.com.